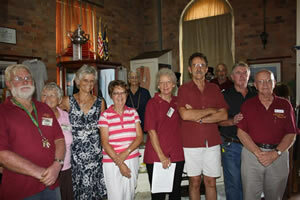 The Maryborough Military & Colonial Museum is a non-profit heritage endowment created and sustained by John and Else Meyers for the benefit of the Fraser Coast community. Volunteers perform all roles in the museum as there are no employees. Presently 100 volunteers share their time, skills and energy to assist in the day to day running of the Museum. All of the museum's volunteers have one thing in common – a commitment and desire to be involved in the preservation and display of our military and colonial heritage. The museum displays military memorabilia from all theatres of war and service people, but with a special emphasis on Queensland and Maryborough. 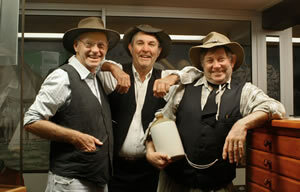 Directors: John Meyers, Allan Woodward and Noel Gorrie. Noel Gorrie is responsible for submitting applications for funding grants and nominations for awards. Attending meetings of service clubs, community organisations and schools to explain the exhibits in the museum and encourage visits to the museum is an important promotional tool. We also visit schools, including special schools to explain the importance of significant events such as ANZAC Day, Remembrance Day and the Battle of Long Tan. Library: Our extensive library has been catalogued by volunteers over a period of two years. A computer database of over 2,000 books has been created, as well as a register of the many hundreds of files, photographs, documents and maps. See Library. A register of 7,000+ items in the museum including memorabilia, furniture and artwork was compiled and is kept current by Allan Woodward. Every item has a specific item number which never changes and can be found by item number, category, ownership, date acquired or location in the museum. Recording and catalogueing: all loans and donations of exhibits are recorded, and the donor receives an official receipt stating its item number and whether loaned or donated. The article is then photographed and placed in the storeroom, with its position recorded, until a decision is made as to where it will be displayed. The display case or drawer is then recorded so at all times we are aware of its location. To create a display a decision on material to be used is made, there is further research for information to prepare captions before they are printed on cards and labels and later the cabinet or drawer is secured. Display items are rotated regularly. They range through the full spectrum of our military and colonial roots providing a vibrant and nostalgia laced insight into the joys, tribulations and sadness that confronted our pioneering, patriotic and hard-working forebears. Repairs and modifications to building are undertaken by a number of volunteers who have a construction and building background. 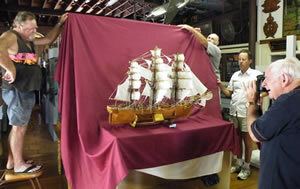 Display cases are built as well as boxes to display medal groups and for protection of delicate fabrics such as flags. 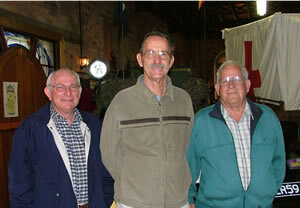 Hosts meet and greet visitors to the museum, introduce them to the exhibits, explain displays and collect entrance fees. As an addition to any event the volunteers will dress in colonial costume. Directors: Noel Gorrie, John Meyers, Allan Woodward. 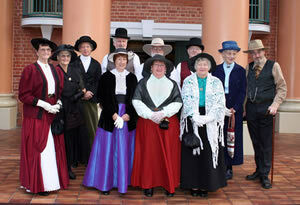 Museum volunteers dressed in colonial costume for the re-enactment of the Maryborough City Hall opening. Volunteers gather after a visit by the Riverside Christian College.